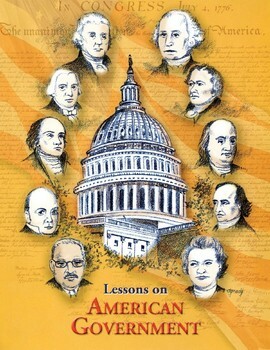 To assess the progress made by women in the United States during the 1960s, 1970s, and 1980s. 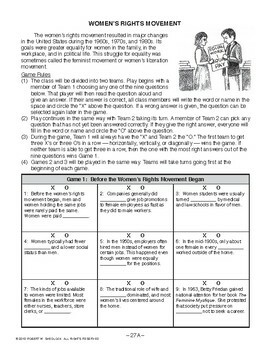 This lesson involves an exciting game in which the class is divided into two teams. Play begins with a member of Team 1 choosing any one of nine questions pertaining to the women's rights movement. The nine questions are arranged in the form of a tic-tac-toe board. That player reads the question aloud and gives an answer. If their answer is correct, all class members will write the word or name in the space and circle the “X” above the question. If a wrong answer is given, the question can be selected again later in the game. Play continues in the same way with Team 2 taking its turn. A member of Team 2 can pick any question that has not yet been answered correctly. If they give the right answer, everyone will fill in the word or name and circle the “O” above the question. During the game, Team 1 always has the “X” and Team 2 the “O.” The first team to get three X’s or three O’s in a row –– horizontally, vertically, or diagonally –– wins the game. If neither team is able to get three in a row, then the one with the most right answers out of the nine questions wins Game 1. Games 2 and 3 are played in the same way. Teams will take turns going first at the beginning of each game.